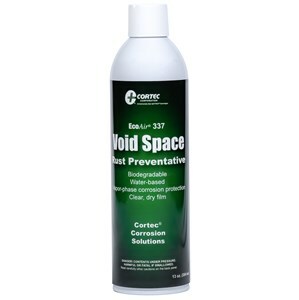 The EcoAir 337 Bio-Based Interior Corrosion Inhibitor by Cortec is a water-based mist for corrosion protection in enclosed spaces. Non-toxic, dries tack-free. For internal protection of crates, shipping boxes, containers, etc. Multimetal protection. Non-toxic. Nonflammable, extinguises fire. 13 oz.